Click the image to see Highlight videos from the 2013-2014 Season/ They will surely get your fire burning for the new season. ON-LINE REGISTRATION (September/October) each year and Coach & Referee Applications Form (both available on this web page). 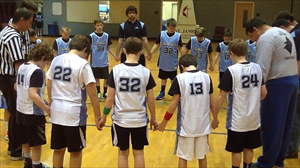 Welcome to Upward Basketball. We had some great things for you and your family in 2013-2014! Upward Basketball & Cheerleading returned for it's 4th season in 2013-2014! God loves it and so did you! St. James UMC & Jarvis Memorial UMC join their Upward Basketball & Cheerleading league in Greenville, NC offering both half & full court games. Our Coaches & Referees focus on developing skills & building Christ like characters in children. Sharing absolutely priceless memorable moments with God around the game of Basketball. © Copyright , Jarvis & St. James Upward Basketball & Cheerleading Ministry - Greenville, NC. All rights reserved.